I am going on a short holiday soon and I had some vacuum packed sauerkraut in the fridge and did not fancy coming back from holiday to be faced with it once again. Does this herald a bout of spring cleaning? I think not. However, I was looking for a supper dish that would help me see off that sauerkraut. Well a "new kid on the block" sort of supermarket, one that is giving the big four supermarkets in England (I don't know about Scotland and Wales) a run for their money, supplied the answer. Just steps away from my home I was able to buy some typical Middle Ages sausages, whose German recipe apparently remains little changed today. And here they are, a pale, finely chopped pork sausage or bratwurst (brat in the USA)! This German favourite since the Middle Ages combines finely chopped pork and spices. But first, sauerkraut or "sour cabbage". Shredded cabbage that has been fermented by various bacteria. Traditionally, cabbage should be pickled in a stony pot or wooden barrel (not a jar). This been done since before the Dark Ages, all across Europe. Cabbage - pickled or not - was a food mainstay in central Europe, in lands that are presently Germany, and in Hungary and Poland too. Also in Scandinavia, on the northern fringes of Europe, where the growing season was extremely short, so priority had to be given to growing a foodstuffs like cabbage that could be dried or pickled for winter use. Further east, all over Russia, rye bread was eaten with "kvas" a main course soup made from pickled cabbage. At these northern latitudes winter trading of food produce was impossible, so there was great reliance on winter stores and only prized cattle were kept and fed over winter. 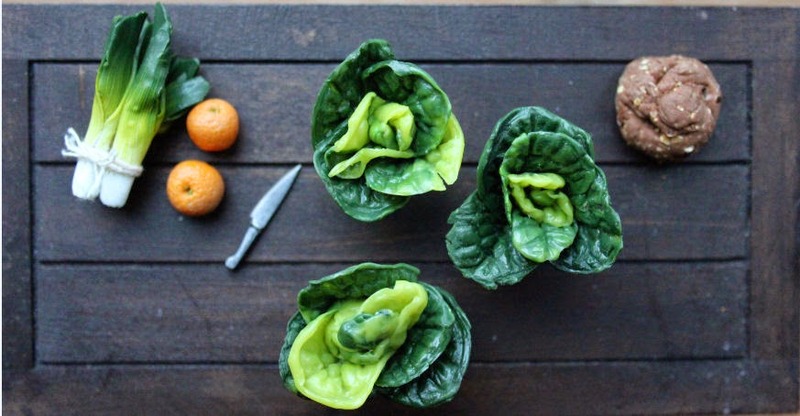 Here are MedievalMorsels 1:12 scale cabbages, dollshouse food for the kitchen, pantry or larder. I do not turn my hand yet to pots or barrels of pickled cabbage, but if the right containers came along I might be tempted to add to my range! Our European forebears would not have known it, but pickled cabbage is a very rich source of vitamin C. Even so, there was an instinct for these things amongst the sailing community and it was likely that several barrels found their way onto Middle Ages and Renaissance sailing vessels. Dutch, Spanish and Portuguese vessels in particular plied the oceans of the world, trading in fabulous, otherwise unattainable spices, foods, cloths, porcelain and other imported goods from China, the West Indies and so on. No wonder Thomas Cromwell, in the BBC’s Wolf Hall dramatised from the Man Booker prize winning novels of Hilary Mantel, tries to explain to a hereditary aristocrat Henry Percy, Earl of Northumberland, that real power lies not with ancient title, or even favour from King Henry VIII but with those extending credit to the aristocracy. The rich merchant traders of Antwerp, Lisbon and Florence who delt in those precious goods imported fro one-way trade. I expect they ate sauerkraut too, whilst at sea. But I doubt any trader or pirate could have got a price for a barrel of it, in lands where luscious fruits and spices grow. And here are one inch scale sausages of various types by MedievalMorsels, dollhouse kitchen accessories for the Medieval kitchen or Renaissance/Tudor dining table. Recreated “puddings in skins” - black or blood pudding, “white” rice pudding, and toasted marrow puddings. For as long as man has been carnivorous, the intestinal tract of meat animals has been used for pudding and sausage casings. 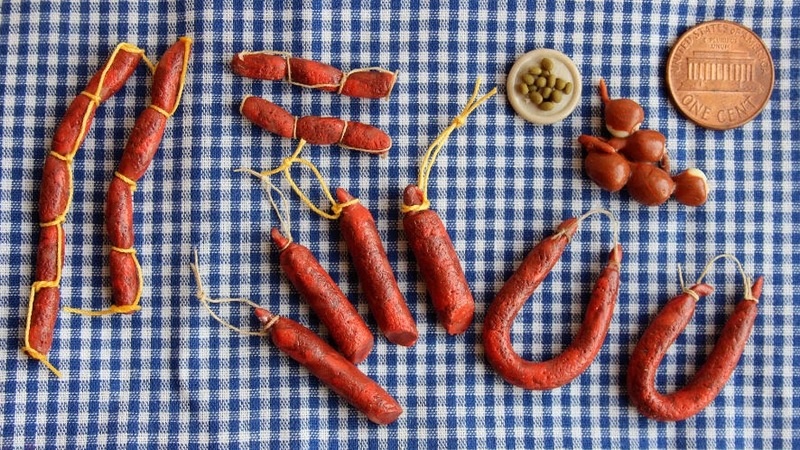 And here are cured sausages for a contemporary rustic or Mediterranean dollshouse setting. Whilst these spicy paprika and garlic flavoured sausages used in modern Mediterranean cooking may not be typical Medieval or Renaissance period fare we cannot actually be sure. Our ancestors in sunny Southern Europe may well have spiced up their sausages to produce the now familiar chorizo. mmm - would you believe it, one is being cooked for lunch as I write this blog-post! Seriously, there are oddments in the fridge to be used up before we fly off for a week - probably to buy more chorizo (chourico) sausages to bring home!